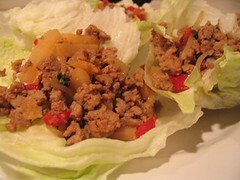 In attempt to get my boyfriend to eat more veggies, I made lettuce cups for dinner. It was easy enough to make: ground turkey cooked with garlic, chopped scallions, diced red peppers, bean spouts, water chestnuts and bamboo shoots. It was seasoned with a mixture of sesame oil, chili bean sauce, soy sauce and pepper. I should have used romaine or butter lettuce but used iceberg instead and filled it with the turkey mixture and some rice. If I wanted to make it low carb, I could omit the rice altogether. Super yummy and easy to make! He ate it up not suspect to the fact that I accomplished my goal! Oh, I suspected all right….